Conventional wisdom on politics in the military can feel almost as age-old as the Constitution itself: Conservative Republicans are strong on defense, and the military skews conservative and Republican. Foreign wars? Bring ’em on! Unwavering ally of Israel? You betcha. More dollars for defense? If not, you must be with the terrorists. One easy explanation has been that Americans in the service have grown tired of a decade of war and identify with Paul’s isolationist anti-interventionist rhetoric. But if the military men and women with whom I spoke this week are any indication, it’s hardly that simple. Paul’s anti-war stance is certainly part of the draw. Last weekend, the group Veterans for Ron Paul 2012 organized an anti-war President’s Day march on the White House. That organization’s leadership includes notable Iraq Veterans Against the War member Adam Kokesh, who unsuccessfully ran for Congress as a libertarian Republican candidate in 2010, and Jake Diliberto, a former Marine who’s previously worked on Rethink Afghanistan, an anti-war project funded by the left-leaning Brave New Foundation. “I have always been a conservative, and I recognize that I am the kind of conservative that doesn’t exist anymore,” Diliberto told me. As for what unites servicemembers behind Paul, he said, “It is fair to say, we all do not like the current trajectory of US foreign policy, and we are cynical about US national security policy.” He added that he’s personally concerned about Obama’s “targeted killing campaign” against alleged terrorists. There’s a certain irony in supporting a small-government candidate while working for the largest federal bureaucracy. The politics of it are, well, complicated. “I do wrestle with this conflict of being a Paul supporter while also being a government employee,” the active-duty soldier said. “Ultimately, in my support for Paul, I care more for the restoration of the ideals this country was founded upon than my current well-being.” At the same time, he added that the military saved him from student debt, while many of his friends are struggling to make it “as baristas and waiters” in the civilian world. “I didn’t join the Army to be some hero that defends the Constitution,” he said. 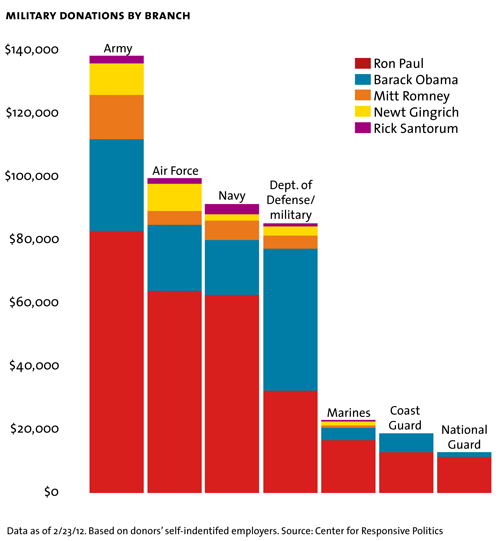 Campaign contributions aren’t necessarily a great indicator of a candidate’s chances. The figures can’t predict how, or how many service members will actually vote, and even if all of them did, they’d represent a tiny fraction of the US electorate. 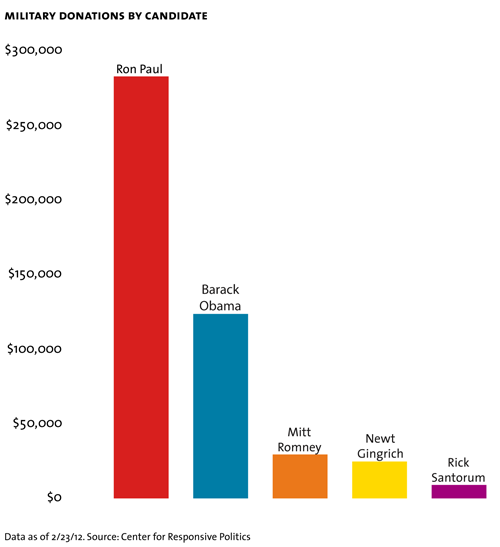 And these donation figures are a drop in the bucket when it comes to overall campaign spending: Even excluding super-PAC money, Obama’s reelection campaign pulled down $29.1 million in January alone; Paul got $4.5 million in that time, according to filings with the Federal Election Commission. Still, military voting jumped 21 percent in the 2010 election cycle, according to federal statistics, and it rose fastest—33 percent—among 18- to 24-year-olds, a demographic that heavily favors Paul (and Obama) over traditional conservatives. In an era in which presidential elections turn on a few battleground states, which can turn on a few thousand votes, the military’s love affair with Ron Paul could play a role in determining the eventual GOP nominee.